LaLD Car Week - Teutonic Tuesday: Tüv geprüft von dem Hinterland? As with my yesterday’s ‘Murica entry, this one is debatable. As it wasn’t put together in Germany. I even doubt there to be a place more remote from die Heimat, as it was from the mind of a guy from... Australia. So why is this one Teutonic? Well, you might recognize those rear blinkers for instance. Yes, they’re from Porsche. And you might recognize the script inside that rear reflector as well, 962 CR, didn’t Porsche have some Le Mans racer with the same number? And that’s what this car in fact was loosely based on. It was created by an Australian motor racing driver Vern Schuppan, who took the Rothmans Porsche 956 to a Le Mans win in 1983. And my guess would be that the Schuppan family once migrated from Germany to Australia as Schuppan still is a not that uncommon name in the land of Warsteiner. All enough reason for me to put it on display on this Teutonic Tuesday as there is no Australian day anyway... 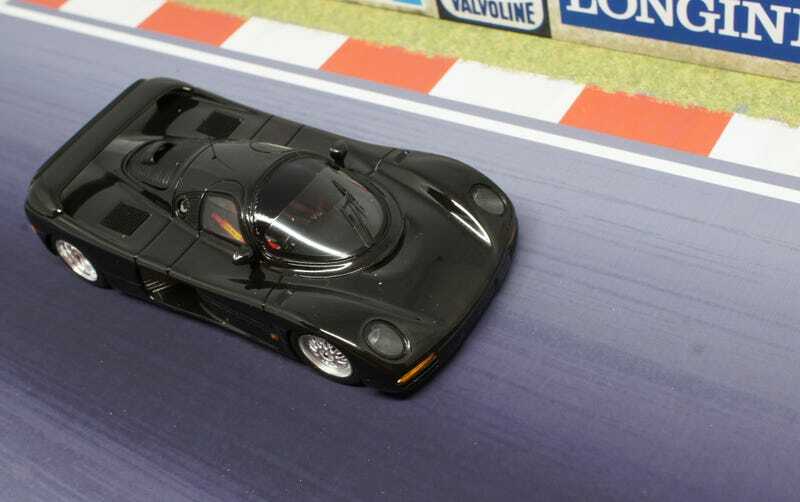 So what we have here is the Schuppan 962CR. It’s pretty obscure as, well, as selling a car that’s actually meant to be able to do a staggering 370 km/h was, in the time before the Bugatti Veyron, not that mainstream. And it wasn’t even produced in Australia actually. For production Vern teamed up with Modena Wycombe Ltd., an English company highly active in the high-end (race-) car market with both sales, maintenance and small production runs. They were highly skilled in producing carbon fiber products, that’s why companies like McLaren, BMW and Yamaha already frequently collaborated with “Team Modena”. It’s not that easy to fund such a project though but luckily Vern found some Japanese backing by the sponsors of his Japanese adventures in the All Japan Sports Prototype Championships. Still, these had to go for $1.9 million so don’t be surprised there were only 5 (some sources say 6) sold, two of which went to Japan. A 3.3-litre Type-935 Flat-6 featuring twin KKK turbochargers was mounted midship, an engine that was also used in the Porsche 962. Although slightly detuned for all day drivability it still was putting out 600 hp and mated to it’s five-speed manual transmission it really was quick. As I said it went all the way to 370 km/h, acceleration to 100 km/h took only 3.5 seconds. After some customers failed to pay ‘m and a general economic recession Vern’s dream was over already again. Not only resulting in losing his newborn car company, his privately held racing team as well. The model it self is a 1/43 Spark. They go for around $60 online. This is the black one, there’s a blue one available as well. I ran into this one for half the price but there’s a crack in the box so that’s definitely something that decreases value on these. I had to have it though for it’s amazing road legal Group C bodywork. But all the details are there. The one armed wiper. The RHD interior. Sabelt script on those 4-point harnesses. Being a Group C racer making shots of that interior is a bit hard for me though, you’ll have to take my word for it. So, das war meine Eintritt für heute. Can’t wait to see what you’ll all come up with on this great Teutonic Tuesday. Tschüss!! !